Sheryl Daane Chesnut was born in the Seattle area but moved at an early age to Marblehead, Massachusetts. After a number of years on the East Coast she moved to the Bay Area; although she has lived in many parts of the state since then, California has consistently been her home. 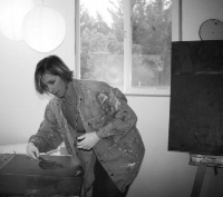 Sheryl earned her Bachelor’s Degree in Fine Art from the University of California at Santa Barbara and UC Berkeley with an emphasis in printmaking and a minor in Business. After graduation Sheryl began a career as a graphic, environmental, and product designer, and her work has won a number of awards both locally and internationally. She also wrote and illustrated a children’s book, I’ll Be There, published by Simon and Schuster. With children growing up and more time and freedom, she is again creating contemporary fine art. She has always been influenced by abstract expressionism and by the artists of the Bay Area Figurative Movement. Experimenting with a variety of materials, Sheryl works with shape, texture, and color to create abstract and representational abstract artwork. She is currently working on a series of representational abstract figurative paintings and abstract paintings based on the writings of philosopher Kahlil Gibran. "My work is intuitive and focuses on shape, color, and fluid line. Details are unimportant and purposefully left unsaid. Most recently I have been concentrating on abstract figurative pieces. The figures integrate themselves into the piece as they seemingly float between the surface and the background. I am constantly striving to take more away and push reduction. I see beauty in the shape of people and items etched by backlighting, blurred by motion and fuzzy in their shadow.